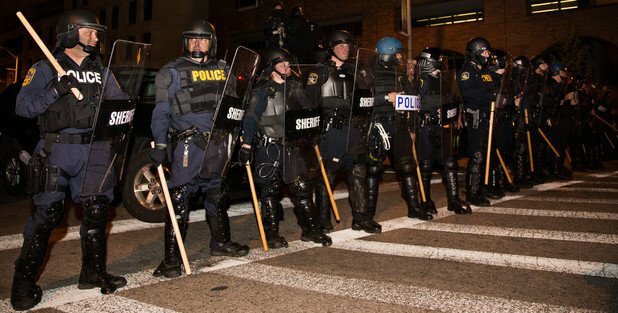 Within hours of the riots, Baltimore city officials declared a state of emergency and instituted a 10 pm curfew. On Friday 1 May, around eighty protesters held their ground in the courtyard in front of City Hall. They were in high spirits and determined to break the 10 pm curfew following news that six Baltimore police officers were charged in the killing of Freddie Gray. The courtyard had become an unofficial media headquarters since the state of emergency began, saturated with TV news vans, cable news tents and lighting crews. 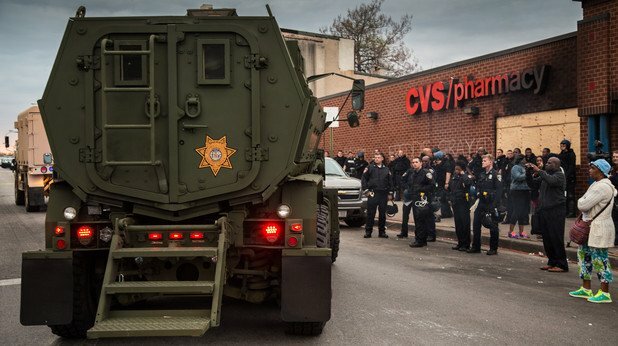 The area also served as a command center for the National Guard and law enforcement. As the curfew went into effect, a line of around a hundred riot police filed into the quad opposite the protesters, who had thinned out from a couple hundred to a few dozen. The mood was tense, but calm. Minutes later, hidden units of riot police thundered into the crowd, charging at frightened protesters who soon learned there was nowhere to run. Protesters were woefully outnumbered and surrounded, with all possible escape routes cut off by either riot squads, officers on horseback, armored vehicles with rooftop snipers or National Guard troops, reinforced by a police helicopter circling overhead. Police officers dressed like storm troopers attacked one protester after the next completely unprovoked. I watched as police all around me tackled civilians, slamming them into the ground face first, piling on top of them and blindly swinging their batons. It was a police riot. During their 22 hour stay in jail, the women met countless Baltimore residents who were swept up by police for breaking curfew while going about their daily lives. “They were put in a cell with us — women, mothers daughters — they got picked up because of this police state. There was a 51–year-old woman who was arrested on her way from work at 4:45 am during curfew,” said Spreadbury. At least 486 people have been arrested in Baltimore since 23 April, a fifth of whom wereheld for 48 hours without explanation and released without charge. 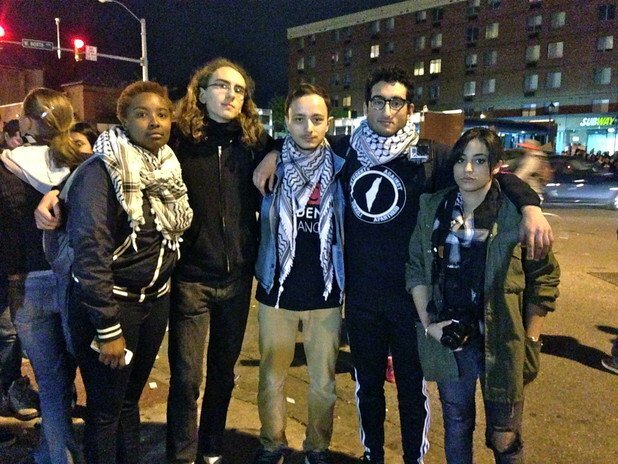 Wearing their kufiyehs — Palestinian checkered scarves — to remain easily visible to one another amid the likely chaos, the group shuffled back and forth between Washington DC and Baltimore to lend their support as legal observers and medics. 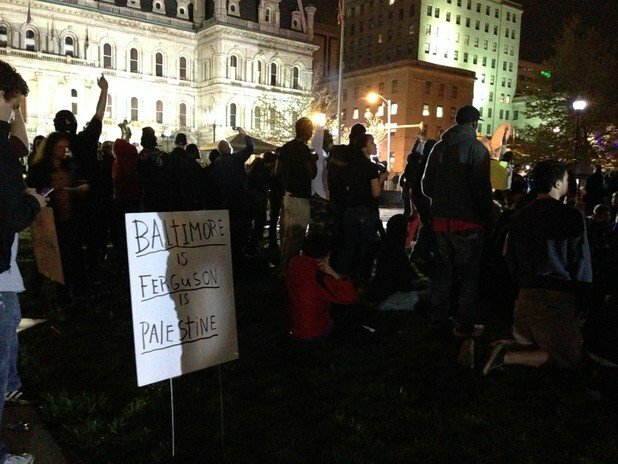 Baltimore city police returned to Israel for more occupation training in a 2009 triparranged by the American Jewish Committee’s Project Interchange. “The most powerful weapon that we have against the police right now is a camcorder or any type of record that you can get against them performing those police brutal events,”argued Moore after his video of Gray went viral. After speaking out about Gray’s killing, Moore complained that police were intimidating him. He was later arrested with two activists from Copwatch, the police accountability organization he is a member of and released two hours later without charge.